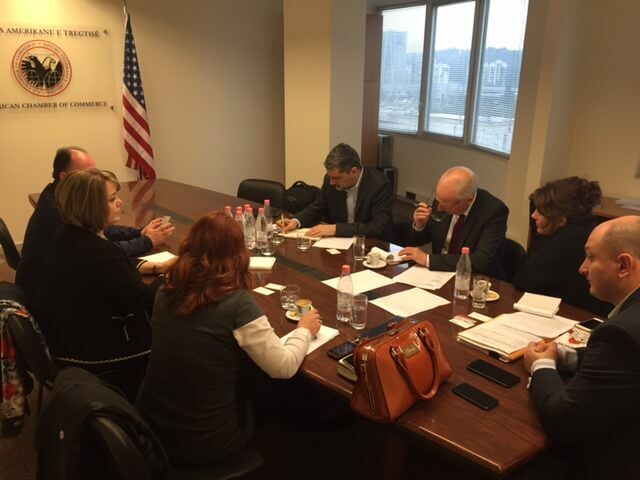 The benefits of being an Authorized Economic Operator and the procedures that businesses follow to gain this status were the focus of discussions between experts of the World Bank and some members of AmCham Albania. The World Bank and the Albanian Government are currently in a process of designing new development policies aimed at increasing the country’s competitiveness. One of the fundamental pillars of this project is the facilitation of trade procedures and logistics. The World Bank notes that despite the achievements that have been made to improve the regulatory framework of the Authorized Economic Operator, the program is still not functional. World Bank experts Mr. Andrew Filmer and Mr. Periklis Saragiotis met at the AmCham office with businesses who have applied for the Authorized Economic Operator program or are interested in doing so, to ask about their understanding of the program, their needs and their expectations of this program. The meetings concluded with renewed commitment to cooperation for improving the business climate in Albania.